We got our Vertec set up and ready to play. 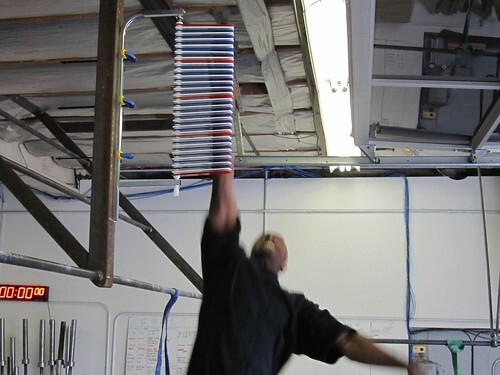 Jason B. takes the first crack at it and sets the current gym record for an approach vertical jump at 35″. That’s high. 2) jump on the vertec. The bottom red vane is at 9′. Every red vane is another 6″. 3) subtract your reach from your jump. Jason’s jump is 128″ and his reach is 93″ – 35″ vertical.